Chicken potpie occupies a spectrum of pastried poultry ranging from a thick stew with rich dumplings to an honest-to-goodness two-crust chicken pie. Mine, directly descended from my mother's, lands somewhere in the middle: a creamed chicken casserole with biscuits baked on top. To somewhat maintain their individuality, I like to prepare the ingredients separately. I roasted two well-salted, skins-on chicken quarters at 400 till they'd rendered some fat, then added two chopped onions and a generous splash of chicken stock. I let the chicken brown while I chopped cauliflower, green beans, parsnips, carrots, and potatoes (something like two quarts of each). The potatoes I seasoned and roasted alongside the chicken, but only for 20-30 minutes to keep them from getting bitter. I steamed the other vegetables till just tender -- this meant the carrots had to be chopped much finer than everything else. When the chicken was fall-apart tender, I pulled it out and let it cool till I could comfortably pick the meat from the bones. I made a roux by adding half a cup of flour to 4 tablespoons sizzling butter, and stirring it about till the flour was all saturated. I added a quart of chicken stock and whisked it all till thick and bubbly -- but not too thick (it ought to be pourable, not gloppable). 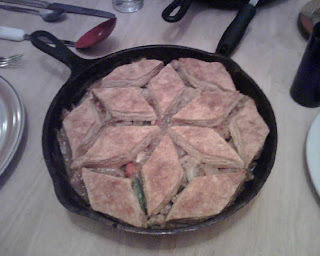 With the potatoes roasted, the veggies steamed, the chicken pulled, and the gravy thick, I was read to "make biscuit". I'm particularly fond of crusty flaky layered cornmeal biscuits as the nicest counterpoint to the creamy filling. So I whisked together 2 cups white whole-wheat flour, 1.5 c. white flour, 1/2 c. cornmeal, 5 tsp. baking powder, and a tablespoon of salt. I grated 10 tablespoons of frozen butter, fluffed it about, made a well, and poured in a little more than 1.5 c. milk. With a few quick movements, I emptied the dough onto the counter, kneaded it with a half-dozen fold-turns, patted it into a round on a light sprinkling of cornmeal, and rolled it (from the center out) till half an inch thick. Mama cuts round biscuits. I like making rhombi (diamonds, slanty-squares, what-have-you), which tile nicely as in the picture and produce less scrap for re-rolling. To finish it off: preheat the oven to 450 degrees, equally distribute the veggies and chicken between two #8 or 9 cast-iron skillets, pour over the creamy-gravy (which I did have to thin a bit with some milk) and top with biscuits. Bake for 15-20 minutes, or till crusty and golden. Serve one skilletful for supper and keep one back for leftovers. Counts as three good doses of religion.